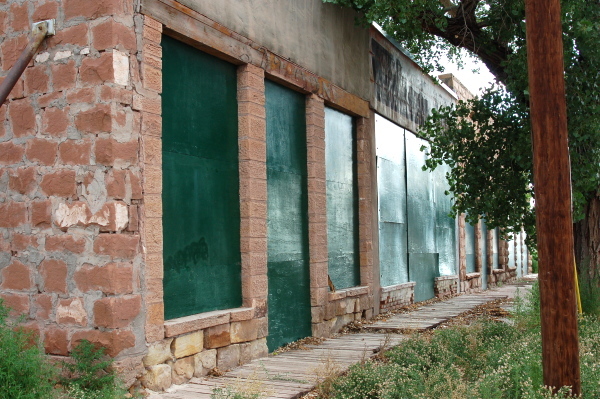 Although by the 1920s Route 66 was on its way, and the Bucket of Blood Saloon had the appearance of a respectable establishment, sidled up to a general store and across the way from an early gasoline station, the saloon still captivated travelers, who stopped in to see the bullet holes in the walls and a stain on the floor that reportedly remained from the gunfight that gave the bar its name. In the mid-1880s, the little western Arizona town of Holbrook was known as a place “too tough for women and churches.” There was no law enforcement to speak of and a group of cow punchers from the Aztec Cattle Company had moved into the area. These cowpunchers called themselves the Hashknife Outfit, and they soon became known far and wide at the “theivinist, fightinist bunch of cowboys in the west.” Rustling cattle from other cattle companies, as well as stealing and shooting were everyday activities for the Hashknife cowboys. They were major players in the Pleasant Valley Feud, one of the longest and bloodiest land and cattle feuds in the history of the United States. The year 1886 was a notable one for the Hashknife cowboys and the Bucket of Blood Saloon. That year alone there were 26 shooting deaths in Holbrook, a notable number for any western settlement at the time, but especially for a town with a population of only about 250. Most of the shootings were attributed either directly or indirectly to the presence of the Hashknife Outfit. The Bucket of Blood Saloon rose to infamy that year when a brutal gunfight broke out between members of the Hashknife Outfit and a group of cowboys who accused them of stealing cattle. 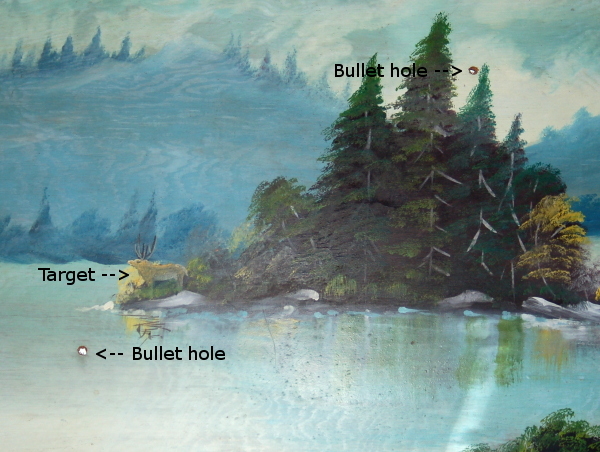 Gunfights and even casual gunfire were common at the Bucket of Blood, in fact, a painting hangs in the local museum bearing two bullet holes from a target competition between two betting cowboys who both turned out to be poor shots. But the gunfight that took place was like nothing that had ever been seen in the saloon before. Historical documents don’t offer a count of how many men died or were injured, but written records say that the result was “buckets of blood” on the floor. Thus, the name of the saloon was changed to Bucket of Blood. 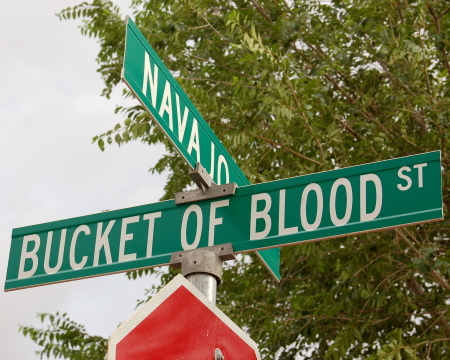 The street that runs in front of the old saloon was renamed from “Central” to “Bucket of Blood Street,” a move that landed the street on a number of top ten lists citing the most unusual street names. Travelers going down Route 66, just a block away, still take a turn off the America’s Highway to get a glimpse of the remains of a saloon that witnessed a time in history when the west really was wild. 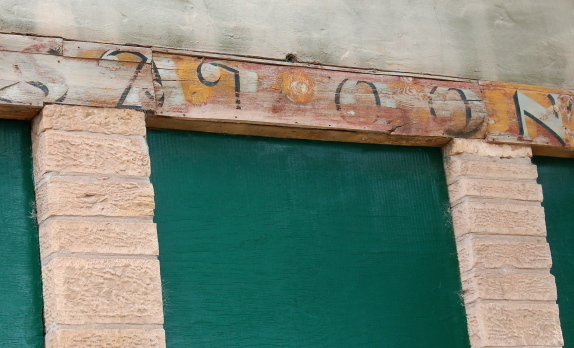 The saloon has stood for more than 120 years, right next to the train tracks where the cattle rustlers of yore loaded their cattle for shipment to the east, surviving floods, fires and the constant vibration of trains that continue to pass by. Much of the building was constructed using local sandstone, which lends a rich red color. 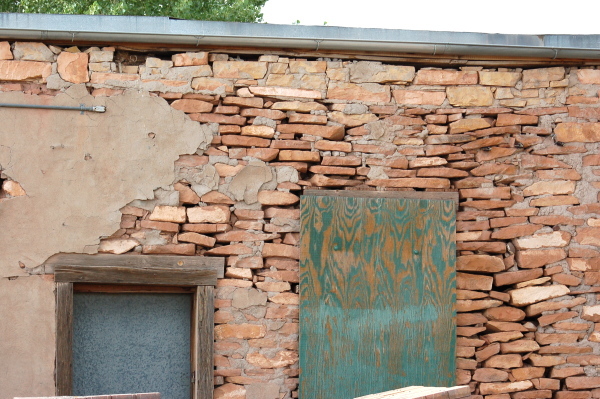 And while the beautiful stonework on the front is still in nearly pristine shape, a protective layer of stucco on the back is falling away, revealing the stacked stone construction in the back that is beginning to give way to the ravages of time. This entry was posted on Monday, August 18th, 2008 at 9:20 pm	and is filed under Built Environment, Geotagged, History, Route 66. You can follow any responses to this entry through the RSS 2.0 feed. You can skip to the end and leave a response. Pinging is currently not allowed. HI: While some town folk would not talk of such things, there maybe a commerical venture here if in fact it’s better / wilder than Tombstone. 1886 was only five years after the shoot-out in Tombstone and Tombstone remains a draw even today. Have the city fathers given any thought to developing this site and preserving History of the old West before it’s all gone ? I’ll visit this site. My Grandfather Eagar hauled freight to Holbrook from Eagar, Arizona; it got a little testy at times. very intersting article. 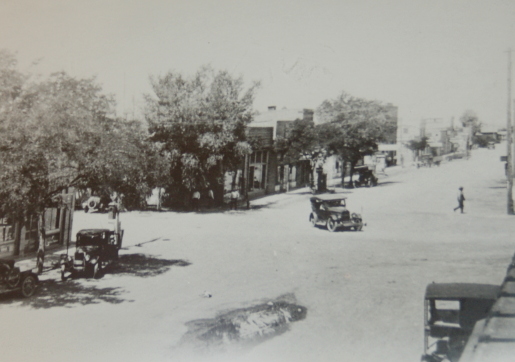 There has recently been established an Histrical district called “Horsehead District” to revitalize this area, The origional name of Holbrook is Horsehead Crossing, and the History is very much as dramatic as that of Tombstone if not more. The motto of Holbrook is, or was, “A town too tough for Churches or Women” This coming weekend, July 12-14, 2013 is Wild West days in Holbrook where a re-enactment of the famous shooting of the Blevins Brothers by Sheriff Comadore Perry Owens will take place. There is a non for profit organiation set up to raise money to fix up these buildings to make them safe. If anyone is interested on knowing more contact the Holbrook Chamber of Commerce. pistol. Mr Chavez fell dead with the first shot. More to the story, but essentially my great grandfather and friends were harassed then murdered because of their race as well as jealousy and envy over my great grandfathers prosperiy. My grandfather, Felix Chavez, was related to Rafael Chavez and used to tell us about that story when we were young. s trying tofind an oldpicture of the orriganal back bar to the bloody bucketi have the origanal bar but would like some real pruff of itlike a picture the origanal mirrior is stil init can hardaly see in it but cool piece if any one knows of a pic please let me know. Carol Johnson, I would love to get as much detail about your story!!! Let me know how I can do that! Yes!! That’s my mom! Susan! Can you email me at fasterlife2005@yahoo.com ?? How exciting! I’m calling Orlando tonight! I live nearby Holbrook. The person who suggested that they do more to promote the town’s history is onto something. They are starting to do that. For example for a long time they had an ‘Old West Days’ celebration at the old court house (with gunfighters and a ‘trial’ for an accused outlaw) but just this year they have changed the name to ‘Bucket of Blood days’ Of course the ‘Hashknife posse’ is now the good guys, every year they ride a pony express type route and deliver a satchel of mail (mostly letters sent by school kids) to a post office down in Phoenix. But yes, there is a whole lot more they could do if somebody had the vision and the resources to put behind it. All Winslow (next major town down the highway) has is a stretch of Route 66, a (now restored) Harvey House hotel and a mention in an Eagles song, but they’ve done a whole lot more, with less to start from. I tried my name is TED S BACA I WAS BURN IN HOLBROOK IN 1932 I AM85 NOT TO GOOD AT THIS ,MY GGGRANDPA & MA AND GRANDPA&MA ARE IN THE CEMATRY AND MOM & DAD TO ERNEST BACA SR.IN HOLBOORK ,THE BUCKET OF BLOOD STREET UESD TO BE (SOUTH CENTRAL) I KNOW I BULIT A HOME THERE A X FROM THE OLD ICE PLANT ,IT IS STEEL THERE .THE BACA ,S WHERE SOME OF FRIST IN HOLBROOK !!!!!!! FROM HOLBROOK IN TO THE ARMY AT 16 I AM A VETERAN OF UNDERAGE (VUMS)WENT IN 1948 OUT 1952 TO JANAN& KOREA MARRIED CECILIA SERNA IN 1952 SHE 16 ME 19 AND WE ARE IN WASHINGTON,UTAH IN UTAH 45 YEARS !!!! !